Barrels. 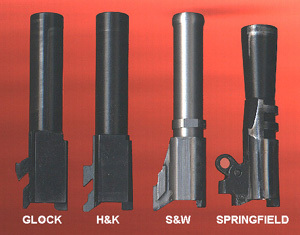 The Glock and H&K barrels are the most similar. Each is the same length, about 3 ¾ inches, and each uses its chamber area to lock up into the ejection port. Each uses polygonal rifling, and this gives slightly increased velocity over conventional cut or impressed lands and grooves. The only downside to this type of rifling is that cast bullets will quickly lead the bore. Both Glock and H&K recommend the use of jacketed bullets only. Both barrels feature an integral ramp, which enhances reliability. However, the Glock’s ramp is cut more deeply into the chamber area, so hot reloads with weakened brass could conceivably cause a case blowout. Glock recommends that only factory ammunition be used, as do most firearms manufacturers. Using reloads voids the warranty; ditto with the other makers. The H&K barrel, while not featuring a fully supported chamber, is pretty close to it. The barrel ramp is not cut very deeply into the chamber area. Here, you should be able to handle hot loads with less worry than with the Glock. Both H&K and Glock use a metal treatment which leaves the surface very hard. Both are quite weather-resistant, fully as much, if not more so, than stainless steel. The Smith & Wesson barrel is the only one of the four which is made of stainless steel. Equal in length to the Glock and HK barrels, it measures out at about 3 ¾ inches. It also has an integral feed ramp, and this one has a fully supported chamber. There would be very little chance of a case blowout with heavy loads. The muzzle has a raised, rounded section at the muzzle. This fits closely into the bushingless slide, while allowing easy tilting for unlocking. All of these designs, by the way, allow the barrel muzzle to fit directly into the slide, dispensing with the barrel bushing as typified by the original 1911 configuration. The Smith barrel has one locking lug which mates into a corresponding groove in the slide. This is in addition to the chamber area, which also locks into the ejection port. This is a very strong lockup design. It features cut rifling, and so should be able to handle cast or jacketed bullets equally well. In the example I examined, however, the rifling was crudely executed with uneven diameter throughout. The rifling would probably even up as the barrel is “polished out” through firing, but it shows that the barrel was made in haste with no attempt to provide premium rifling. Likewise, the crown of the barrel was ragged. This required some simple polishing to correct. Maybe my sample was a “Monday barrel,” who knows? Smith & Wesson’s quality control department missed this one. The Springfield barrel was the shortest of the four, at 3 ½ inches. As it also features compensation ports which vent propellant gases through the slotted slide, it should come as no surprise that you will not get as much velocity from this pistol as you will with the others. The barrel has a reverse taper, with the muzzle mating directly into the slide. All Springfield lightweight .45 pistols (which use aluminum frames) have a ramped barrel, and this one is fully supported. The ramp does not cut into the chamber area at all, lessening any worry about blown cases. The ramped barrel also eliminates any concern about rounds beating the aluminum frame during the chambering cycle. The traditional 1911’s two locking lugs which mate into matching recesses in the slide are present. The cut rifling is clean, sharp and uniform. Springfield uses a two-piece barrel, in which the forward part of the barrel is sleeved into the locking area. Some condemn such barrels as being weaker, but if properly done, there is no disadvantage. The barrel is made of tool steel, and is blued except for the chamber area, which is polished bright. I would not recommend using cast bullets in this barrel due to the extra cleaning chore that the vents would demand. Cleaning lead deposits out of 10 little holes is not something I would choose to do willingly. Of course there is no problem using lead bullets except for the cleaning nuisance.